The Sacred Page: JP Catholic West Coast Biblical Studies Conference this January! 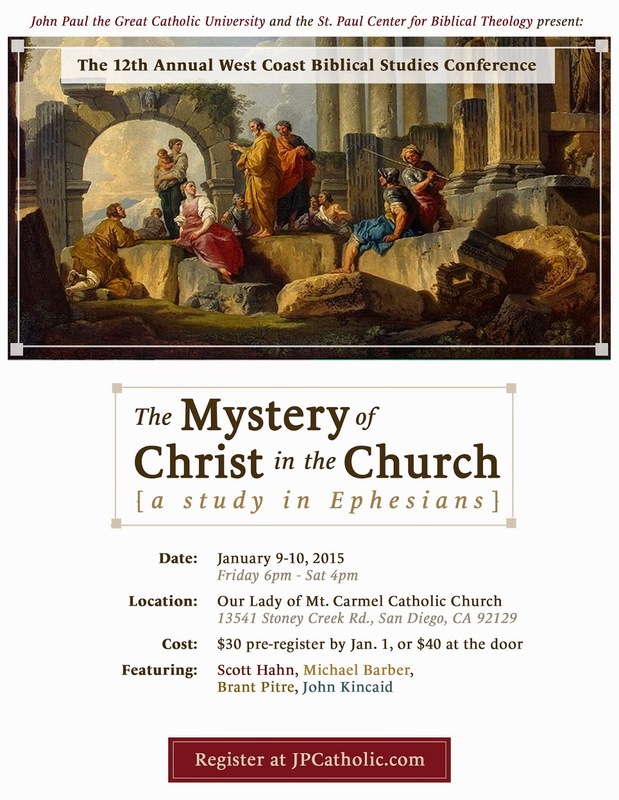 JP Catholic West Coast Biblical Studies Conference this January! I hope you'll plan ahead to come to the JP Catholic Biblical Studies Conference this coming January. Scott Hahn, Brant Pitre, John Kincaid, and myself will all be speaking. You can register here. That having been said, today I turned 6 years old. Six years ago today I was miraculously (supernaturally, unexpectedly and spontaneouslty, and unaccounted for by any other means) healed of PTSD by Jesus Christ, the one, true God Almighty, after having been psychotic for 38 years. I don't have enough words. She has enough words and knows this. Week after week Susan Moores accident is discussed. It's getting old. This is your blog Dr. Barber, reclaim it! what accident was she healed from? This is new to me, can God do that? If he can its amazing! "I was miraculously (supernaturally, unexpectedly and spontaneouslty, and unaccounted for by any other means)"
"During the two years He had me do street ministry.....I was getting to my healing testimony (50% confusion, 25% terror and/or rage, 25% worship)." "I believe He expresses miracle after miracle, and signs and wonders, in all of our lives. Just some of us notice them..."
"I noticed one of the favorite pastimes of livestock would be to lay down in verdant pastures. Napping in cool, thick grass beat relentlessly sinking in a mucky pen every time"
I had been miraculously healed in KY. Then Jesus brought me back to Ohio where I grew up. I took a nursing job, but quickly became disillusioned as I realized that secular hospital nurses nowadays are not permitted to treat a patient holistically –body, mind, and soul- they can only treat the patient’s body. "Why is it that we are not fighting cessationism in, like, a box full of boomerangs? Where is He, if not right here, right now, miraculously and wonderfully holding all things together?" Miraclously wonderfully! ah! "I was not intending to deceive in these responses, what you have witnessed here is the effects of, and my honest response to, His direct revelation in my life today." "In order to feed his specific flock, the teacher will have to say the teaching in a way his flock will understand. That's what I mean by 'relativizing' it." "Affter getting ridof all my stuff and 17 animals, the first people Jesus had me to tend to were my parents, who were both ill....I was also estranged from due to my previous psychosis. What a ride my life has been. Glory to God in the Highest! "My understanding comes from suffering with Post Traumatic Stress Disorder for 38 years, and being psychotic with the resultant hallucinations. Have you ever hallucinated? It seems all philosophers and theologians and catechetics should have a few hallucinations"
"He miraculously healed me of the psychosis on 11/10/2008. Yep, He supernaturally instantaneously and unexpectedly made me a new creation, and in 33 days I’ll be six years old." She celebrated that birthday this week so its well down and she had to say something about it. Cant miss the birthday! "Satan, in his genius of deception, is brilliantly slick like that." "I woke up at 3 am." Do you know how many times she has conviniently woken up at 3am? One time I was up at 240 (11:40 pacific) as a test. Sure enough 30 mintues later she did exactly what I expected. She posted. "And then He grabbed that yucky lopped off ear from the ground and stuck it back on the guys head before being carted off to be tortured and crucified naked...And to think I have faith in Him instead of Mr. Mills. I bet Mr. Mills never would have healed me..."
"Someone rear-ended me going 60mph. My brain got rattled. The effect of that rattling knocked out my short-term memory, about 90% of my nouns and ability to speak, the ability to distinguish left from right, and the ability to sequence anything (such as how to make a sandwich, order my words into a coherent spoken sentence, and add a column of numbers to balance my checkbook). For the second time in my life I was told I would never be a nurse again." "I think, being humans who desire to be merciful to others, we are too eager to rationalize human behavior instead of calling a spade a spade." Im calling her a a spade. "I was exposed to satanic cult activities as a five year old I am having difficulty getting my head around this" Was this from her accident as well? "When I was miraculously healed and therefore able to join the community of believers"
"Almost immediately after He miraculously healed me 5.5 years ago of the psychosis, and I was out of psychological shock, I became worried"
"I can see my writings have offended you. Please know I do not desire to offend anyone. I am very, very sorry to have hurt you in any way. Will you please forgive me?" And finally Susan Moore: "Let us never tire of doing good, for at the proper time we will reap a harvest if we do not give up (Gal. 6:7-10)." "Dr. Barber, feel free to rip it apart. My Latin professor explained, too, that good teacher use wrong answers from which to teach the correct ones." Having stuttered all the way into my 20's, and having been painfully reclusive due to psychosis, and then having my speech knocked out in a head injury 6.5 years ago, today is the first time I have spoken like that, in front of His church. "I have been wondering why, when I am speaking to a person and am wondering if that person is quietly freaking out, sometimes I will abruptly turn sideways and sit right down where I am and ‘doodle on the ground’. Usually there is a period of silence, a few pointed questions asked by that person, to which I continue to stare at the ground while giving quiet, concise and simple answers, and then, in essence, the person drops their stone, and quietly walks away." I hope when I grow up I write as well (and as gently) as you do. (April 19th 2014). Wait a minute. So now she still needs to grow up and is no longer 54. "I am real and my story is real"
Wow, you sound really mad. Why? What has she done to you? I've read some of the blogs and it seems you lump what she says together, when she's not always talking about the same thing. Hey, do you have PTSD, too- is that why your mad? What blog did she not talk to you, I want to read it. She thanks the blog writers a lot, so I don't think she's against them at all. It seems the blogs stir her thoughts, and she shares that. Anyway, I'm going to find a c. priest and see if its true, if God can heal like that. If its true and he healed me I wouldn't know what to say, at least she's trying! Also, will ask about baptism, if being baptized as a c. can save your life. Maybe you should get baptized too? Maybe not, though, were not babies. "In the last 2.5 years I have learned there are some dogs who come forth aggressively to bite because they perceive me as treading on the territory they are bred to protect, and those dogs will go to whatever means they can think of to remove me from their territory. Those are the false teachers of John 8:33-59." "One must be on the look-out for children who curiously follow what they are hearing or seeing and leave their herd and become lost (the grass is always greener…); children who mistakenly follow the wrong pair of adult legs and end up in another family’s herd (oops, wrong faith-tradition); and child abductors (thieves and wolves in sheep clothing)." "Unrelated to any of that, when I was 10 years old I experienced my first symptom of Post-Traumatic Stress Disorder. That symptom was a flashback hallucination, a momentary flash of a tiny memory chip, of some part of having been attacked by three men or groups of men who were unrelated and had no knowledge of each other’s presence in my life." So somewhere in her mind she was brutally attacked not once but three times, but dont worry folks! Its just a flashback and it may not be certain. This could be an effect of her accident playing tricks on her. "More to come later. But in the meantime, have you ever wondered what it must have been like for Isaiah, or Daniel, or any of the prophets –to be living in the world and yet say and do the bizarre things they did? Bizarre by the world’s standards, that is. But at times it must have sounded bizarre even to their own ears." "Okay, done with that. No more pity parties. Let's fix that." She pity parties herself every single week. If she actually has psychosis, than as loving Christians, I think we need to respect this. But we also need to respect that this is a blog for serious contributions and if someones psychological state is pushing others away from posting who otherwise would be posting than posts like Susan's should be monitored for quality and training purposes. Ok, are you finished? You didn't say what you are mad at. You are really mad because you are lumping unrelated things together -why? I don't see her pitying herself, why would she pity herself if God healed her? That doesn't make sense, it sounds to me like maybe you pity yourself? She obviously is not stopping you from posting, how could she? If a stranger's words can stop a person from responding to a blog, then that stranger doesn't have the problem, that person does. Anyway, if you want to tell me what your problem is, I will ask the c. priest about that, too. If not, that's fine too, perhaps you will find one and ask him yourself. I think you may have misunderstood me. I didn't say I was mad. Someone calls me a baby, someone tells me to shut up. I understand the frailty of human nature and that human perspectives are not the same as God's perspective. I can be upset with something without being mad. If relating unrelated things together is your argument for being mad, than you are failing to see what I'm saying, for the irony of your statement is the principle statements that Susan Moore often makes are often unrelated to the subject at hand. You didn't acknowledge any of the errors but diverted the subject onto me being mad. Maybe you should just read the above statements and acknowledge that I'm right. Sorry I didn't see your first comment. I never said that she was against the blog authors. I’m very sorry I have not responded to your responses to your satisfaction. It seems, though, if through your above efforts you truly intended to show a disunity between the authors’ blogs and my blog responses, to each of your entries above you would have also posted the subject of the authors’ blogs, so that others could tell if there was disunity. Otherwise, the other anonymous is correct in saying that you have lumped a bunch of unrelated accounts together in order to make what I say sound chaotic. That kind of intentional act of bearing false witness comes from one’s fallen human nature. But all Catholics are undergoing conversion and becoming more like Jesus Christ, including me. One of the ways I have grown in the last six years, since my healing, is that I have become more patient with people who bear false witness against me and the testimony of healing that God has given me. I became more patient when I realized their issue is not against me, but is against God. Sometimes I don’t know how to help them believe except to pray for them, because I am not the one that hands out faith, God does that. He is the only one who can. 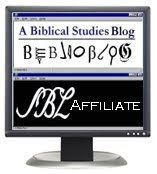 All the blogs are about God and are studies of the Bible, beginning as a toddler I had awareness of God’s presence in my life, and I have been reading the Bible since I was 12. This blog is very exciting to me, and makes my heart do somersaults!! It’s true, I simply share my thoughts of what the writings mean to me. I appreciate that you and others may desire all the responses to be academic and sterile, but Jesus doesn’t ask us to understand Him, He asks us to love Him and follow Him. If we do that, more understanding will come with time. When I respond to the blog writings, I am expressing my love for Him and am following Him the best way I know how as a blog responder. My best advice would be if you don’t want that, then don’t read the comments. I would have to agree. Though I do think that for the general public, posts like your posts on "meta language" would be more interesting to read then your posts on psychosis. That's a focus on the self, whereas meta language is more of a theological subject. Thanks (annonymous #3? ), for your support and direction, very much appreciated. Ya. Continuing. Baby was not in reference to you, Anonymous number 2. I did not read your post. Anonymous, meta language is not really a theological subject. In logic and linguistics, a metalanguage is a language used to make statements about statements in another language (the object language). This just proves my point that her posts are often unrelated to the subjects at hand. "One of the things that happened, is that when I was 5 I was exposed to a cult. I was expected to go along with them, and they attempted to indoctrinate me. But I said, “No.” Not in a rebellious or angry way, I simply decided that what they were asking me to do was absolutely wrong, and I would not do it. So, they tortured me to break my spirit, but it would not break." Today: "Otherwise, the other anonymous is correct in saying that you have lumped a bunch of unrelated accounts together in order to make what I say sound chaotic." Ok, that’s closer to the truth, but they are still not quite in order so it still sounds chaotic. “One of the things…” goes before “…after He healed me…”, because I was 5 when I was exposed to a cult, and older than 5 when He brought me back to Ohio. I would not have been able and ready to defend my flock when I was 5. When I don’t forgive someone, I learned it is only I that suffer, and suffer greatly (in my mental health, physical health, spiritual health, and relational health –all of it). So what’s the point of being angry? God promises to avenge, and He can do so in a much greater way than I can. Forgiveness brings freedom and peace. I thought I would never be able to forgive some people, but Jesus showed me how. He was innocent of all wrongdoing, yet He was stripped naked, tortured and nailed to a cross. While hanging on the cross, He said, “Forgive them, Father, for they do not know what they are doing.” If Jesus can forgive us in His circumstances, then certainly He will help me forgive people in my own circumstances. He will help you too, if you ask Him to. Forgiving others is freeing, it’s our way out of chaos. So just so we have this strait for the record. I complained that her comments are off subject, used specific examples of language that is complete garbage, and she come back saying "forgive them father they know not what they do" putting the focus on herself. That's provocation. That's cyber bullying. Where are the days where the sacred page used to be a place where people could come and make constructive comments on theology without both theology and psychoticism playing a role in the same paragraphs? let me guess...its too much fun.